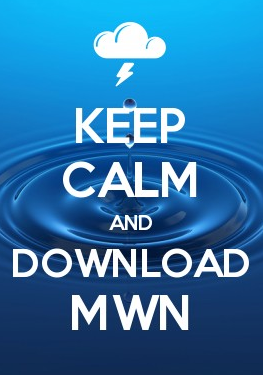 MWN Blog: Snow day recap - perhaps it wasn't ideal, but it was interesting! Snow day recap - perhaps it wasn't ideal, but it was interesting! Well, many of you got your wish - a day at home for kids and many parents alike! Enough snow fell to call off school and many businesses. I heard from several of you who (like our family) enjoyed a bonus lazy day on the first weekend after school starts back to recuperate from getting back into the "routine." And for those decision-makers out there, it started early enough that calling off school, etc. However, it probably wasn't the ideal snow day for some. Why? It was COLD. I know, it has to be cold to get snow, but it was *really* cold. I think many would prefer a "30-degree-no-wind" snow day to a "wind-chills-near-10" snow day. It was hard to stay out for very long. The snow quality was sub-par compared to what we're used to. Not only was there not quite enough in the heart of the metro (granted there was more in north MS and up north a bit), but it was too dry to pack. Hard to make snowballs and snowmen with dry snow. Though it was drier than we usually get, there was enough on the streets prior to sunrise that when cars did get on it, and weren't going very fast, it just packed it down, which resulted in a thin layer of ice by the afternoon and evening. So it was too cold, too dry of a snow, and hard to drive in. That "somewhere in the metro" ended up being along and just south of the state line. Model data really caught on to the scenario that played out on Thursday morning and the new high-resolution hourly model data generally did a nice job of pinpointing where that band would set up by very early Friday morning. Kudos to our model developers at the NWS and affiliated research institutions for some fine work being done well-behind the scenes. Radar loop from mid-morning Friday when light snow was moving in two directions - west to east with the main weather system, and north to south as snow bands at lower levels than the primary system. Snow moving in multiple directions is still seen at mid-afternoon. 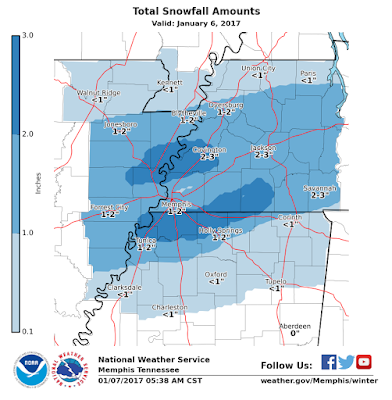 The north-south bands of snow continued for several hours on Friday. There are a couple of possible hypotheses on this strange phenomena, which includes multiple snow bands moving from north to south over the metro and more organized areas of snow moving from west-to-east (which was the snow that was better forecasted and driven by the synoptic setup). One scenario, and the one I find most plausible at this point, involves the influence that warm water can have on a very cold airmass. It's much like lake-effect snow off the Great Lakes, only at a smaller scale. Cold and fairly dry air moves over that much warmer body of water, picks up moisture from that water, and also starts to rise as it warms a bit from the warm water below (warm air is less dense than cold air and rises). As the wind pushes the air downstream and it begins to cool, the moisture falls from the cooling air, creating a "path" of precipitation in a band that parallels the wind flow. The tell-tale signs are cold air blowing over a fairly substantial body of warmer water and bands of precipitation that are exactly in line with the low level wind. There were 3 bands that formed in the morning. The first (western band) is believed to be a lake-effect band from Big Lake, which is just west of Blytheville, AR in Big Lake Wildlife Management Area. The second (center band) is downwind of Open Lake (which is also right next to the Mississippi River) west of Ripley, TN. The easternmost, third, band was a little harder to figure out, but could be traced back to the Mississippi River itself, in an area west of Paducah where the river is fairly straight for several miles and is exactly lined up with yesterday's wind flow. The "fetch" is the amount of warm water the wind traverses. The longer that is, the more moisture it picks up. In this case, the wind was blowing from 020° (or NNE), which lines up with a length of the river that is oriented in the same direction. It's conceivable that we had the perfect scenario for river-enhanced snowfall yesterday! See the map below. Three morning bands of snow, possibly traced back to their origins if they were indeed lake/river-enhanced snow. The eastern band had a long way to travel from north of Union City, but it likely could have been snowing all along that path from Ripley to Dyersburg to west of Union City. The radar would have been "overshooting" the relatively shallow depth of those precipitation bands that likely only extended a couple thousand feet into the air. The second hypothesis, which seemed a little more reasonable as we got farther into the afternoon and the bands became less pronounced, was that the light snow over the metro was due to a cold air miniature version of "convective rolls" which manifest themselves as cloud streets, or lines of cumulus clouds that form parallel to the wind flow. (See the Facebook post embedded above that has the satellite image of snow, then look at the bottom of the picture for cloud streets over the northern Gulf formed by Arctic air blowing over the warm Gulf waters. Another example is below.) If this were the case, in this situation we didn't just have rows of clouds, but clouds that precipitated! Satellite imagery didn't show these clouds like they usually do when typical cloud streets form because the sky was covered in clouds. They would've basically been buried by the other clouds around them. A hidden explanation? Perhaps. 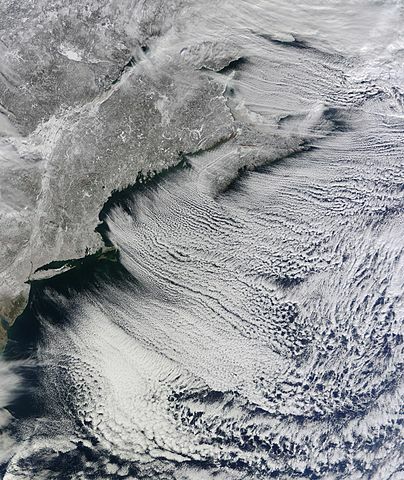 Horizontal convective rolls, or cloud streets, off the U.S. Atlantic coast. Credit Jeff Schmaltz - NASA Earth Observatory.